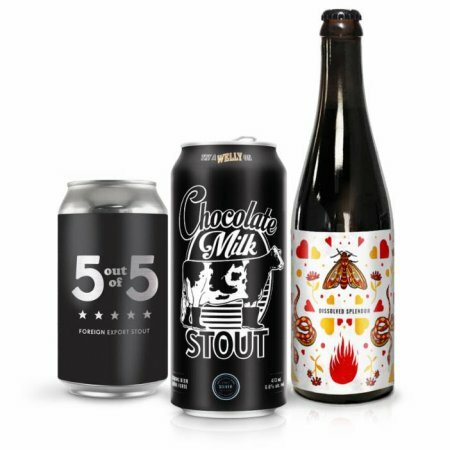 GUELPH, ON – Wellington Brewery has announced details of three dark beers that will be released over the next few weeks. Today (January 31st) sees the return of the seasonal favourite Chocolate Milk Stout (6.6% abv), which will be available in 473 ml cans at the brewery and select Beer Store locations. Coming next Friday February 8th is 5 Out Of 5 (6% abv), a Foreign Export Stout brewed in collaboration with #IGBrewCrew that will be sold in 355 ml cans exclusively at the Wellington retail store and online shop. Available on Thursday February 14th via the same outlets will be Dissolved Splendor (11.8% abv), a Bourbon Barrel-Aged Baltic Porter packaged in 500 ml bottles.